Take all the ingredients together in a bowl and mix it well. Add little water if you needed. The consistency should be slightly thick smooth batter. Keep it aside for 15 minutes. Heat the non-stick tawa / griddle with little oil. Cut the bread in to triangle or as your choice. 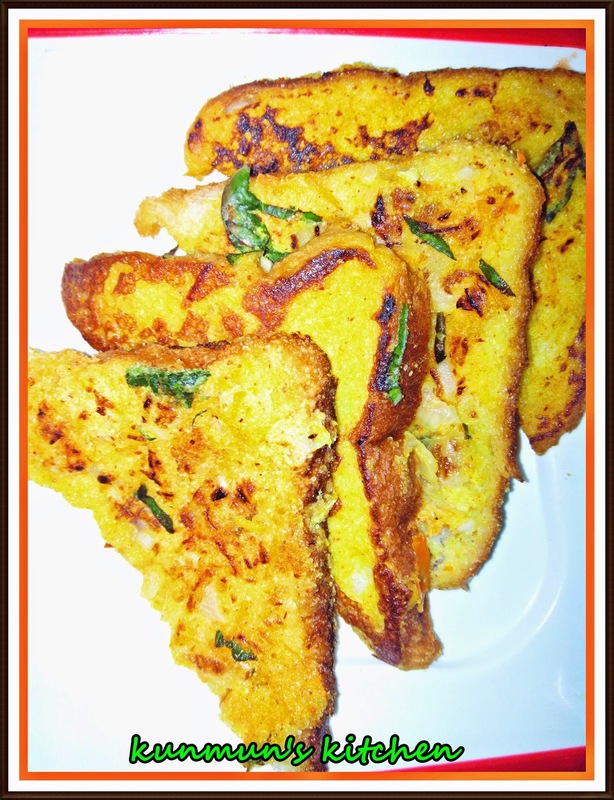 Dip the slice of bread in the batter and place on tawa. 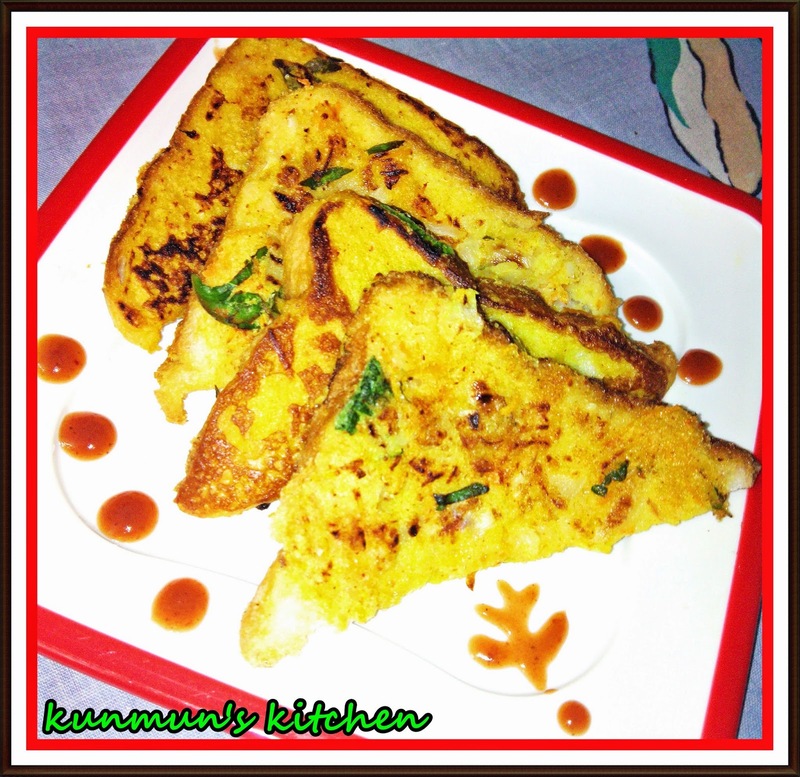 Toast both the sides of bread til it comes out with a light golden brown colour. Remove from it flame and Serve with ketch-up / chutney / curd ...Enjoy it !!! WOW! FIRST BLOG!! LET ME INTRODUCE MYSELF AND MY BLOG!!! Hi everybody, Welcome to my blog. I am Sagarika,from Orissa.I am so excited to start connecting with you all and learning more from you.I love to read cook books and love to try new recipes in my kitchen.But not prepared so much due to lack of time as I was in job.I got the inspiration for cooking from my Mamma n mom-in-law.After marriage I always used to make new dishes for my hubby and gradually this becomes a passion for me.My hubby loves food and my mom-in-law is a terrific cook. Now a days I am doing a lot of experiments in cooking which is very much appreciated by my Family & Friends.My hubby always supports n encouraged me to do new things and helps me also in my kitchen.In free time,I follows many recipe blogs in net and finally ideas came to mind for creating my own blog and share my ideas of cooking with you. Please give your valuable comments and suggestions which will help me to proceed ahead n will gives better to better recipes for you..